Summary: Learn how to prepare and fix architrave. The wooden moulding that surrounds a door is called an architrave and consists of two vertical lengths and one horizontal length. If you want to fit or replace an architrave, first remove the old one with a hammer and chisel, prising it away from the wall. 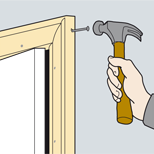 When buying new architrave ensure it is of the same thickness as the old one otherwise you may find you need to insert shims or plane the skirting boards so that the architrave and skirting fit flush together. Cut three lengths of architrave a little longer than you require. 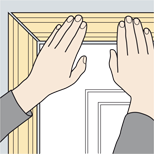 Ensure the inner edge of the architrave is 5 -10mm (1/5 - 2/5in) away from the edge of the door lining. This is the margin. With a pencil, mark the margin around the door lining creating a right-angle at both corners. 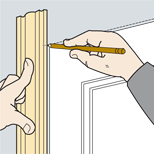 Position a length of vertical architrave against the margin on the left-hand side of the door and accurately mark on the timber where the right-angle of the margin comes. This mark indicates where you need to cut a mitre join at a 45° angle. To accurately cut the mitre join it is best to use a mitre block. Loosely fix the mitred architrave to the wall with a couple of nails. Taking the horizontal length of architrave cut a 45° mitre cut at the end that will make the joint with the vertical attached to the wall. Then holding the horizontal length of architrave in place against the margin, mark the position for the other mitre cut. Remove and make the second 45° mitre cut. Position the second vertical length against the margin and mark and cut the mitre as with the first vertical length. Secure the right-hand vertical length of architrave in place against the margin with a couple of nails, but don't fix permanently at this stage to allow for minor adjustments if necessary. 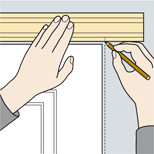 Apply strong wood glue to each mitred end and slot the horizontal length of architrave in place and nail to the wall. 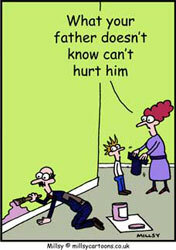 Then secure the vertical lengths of architrave with nails at regular intervals. A pilot hole should then be drilled through the top of the vertical architrave on both sides of the door. This will allow you to knock a 25mm (1in) lost head wire nail through to the horizontal architrave without splitting the timber. All nail heads should be knocked below the surface of the timber using a nail punch and then filled with filler prior to painting. Position the architrave against the margin on the left-hand side of the door and accurately mark the right-angle of the margin. Hold the horizontal length of architrave in place against the margin. Mark the position of the right mitre cut. Drill a pilot hole and knock a 25mm lost head wire nail through to the horizontal architrave.